A trio of seasoned black beans, pinto beans, and crunchy taco-roasted chickpeas team up to take your taco game to the next level with these tasty vegetarian triple bean tacos! My love of tacos is one for the romance books, folks. Hot, steamy, and… errr I can’t finish that sentence without sounding like a total creep. Though we’re both omnivores, Paul and I have refrained from buying ground anything for the past few months. If we can’d find meat that’s grass-fed, additive-free, and preferably local, there’s just no point. We’d just as soon wait for the opportunity to shop from a source we care about than pick up something for the sake of buying it. So when taco night rolled around I promised to whip up my famous Lentil Veggie Tacos. Only I was out of lentils… and mushrooms… and ohmygosh where are my pants!? Kidding, but I did have to brainstorm a tasty new taco filling. Enter my awesome new Triple-Bean Tacos! I even caught the chickpea scooping some out of the bowl when I wasn’t looking. Huzzah! The smashed pinto beans hold the mixture together while the whole black beans and crunchy taco roasted chickpeas add flavor and texture. I love them! You’ll love them! Let’s make them, shall we? 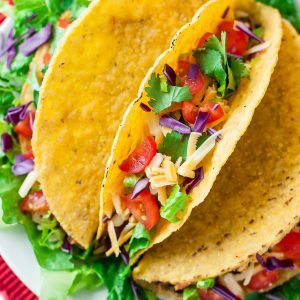 These tasty tacos can be made vegetarian or vegan depending on your choice of toppings! Woot! Black beans, pinto beans, and crunchy taco-roasted chickpeas team up to take your taco game to the next level! 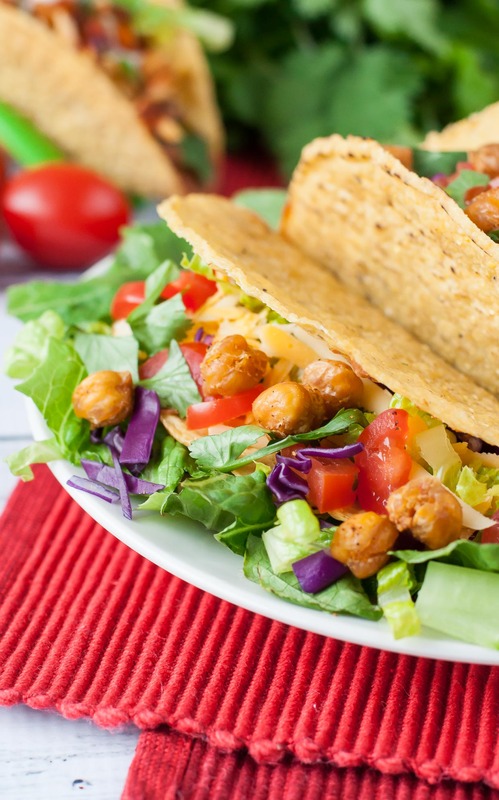 You'll love these Vegetarian Triple Bean Tacos! Use a bowl to toss together chickpeas, olive oil, chili powder, cumin, cayenne, and salt. So fun right? Hopefully you didn't spill them all on the floor! Spread chickpeas out, spaced, on a foil-covered baking sheet and sprinkle with a little extra chili powder for good measure. Pop them in the oven and roast for 30-40 minutes on the center rack until perfectly crispy. Next start on legumes numero dos and tres! In a small pot, combine refried beans, black beans, diced tomatoes with green chiles, and enchilada sauce, and season with chili powder, garlic powder, cumin, cayenne, and salt. Heat on medium-low and allow the mixture to simmer while your chickpeas roast. Stir occasionally to prevent sticking. Chop all your toppings while your beans cook to perfection and get ready to party! Pile each taco shell high with the black bean mixture, salsa verde, crunchy chickpeas, and a mountain of toppings. Enjoy! Recipe makes 3.5 cups of tasty taco filling which is enough for 8-10 tacos. 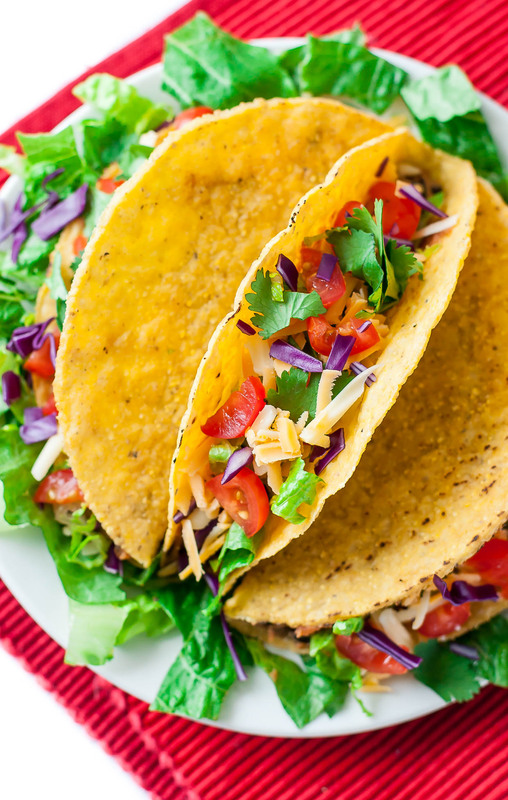 Leftover filling can be stored in the refrigerator for up to four days, turned into quesadillas or taco salad bowls, or even frozen for later! Back in my earlier days as a vegetarian, I used to think plain refried bean tacos were totally the way to go. Truth be told, they were lacking in more ways that one. The texture, flavor, and overall factplantability were just off. They needed something more. They needed to be THIS recipe. The combination of smashed and whole beans (with a little crunchy chickpea action for good measure) keeps the texture on point, making this healthy taco filling a perfect substitute for meat! I seriously wanted to do a little touchdown taco dance after each bite, and already cannot wait to make them again! So… what are you waiting for? Live every day like it’s Taco Tuesday with these tasty triple bean tacos! 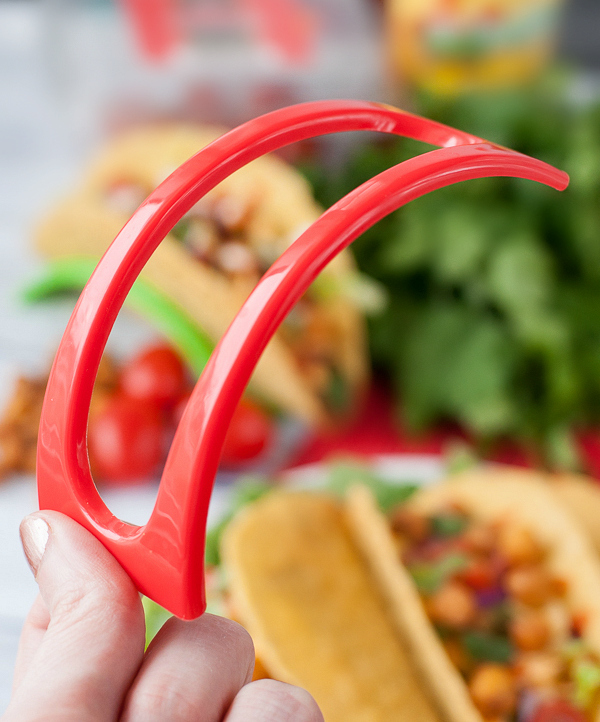 And because I know you’re going to ask, these snazzy little taco holders are optional yet AWESOME. I totally regret linking to that page, now I want a set of matching taco plates and taco trucks. That’s the perk of being a toddler mom, right? Second childhood, FTW! Hai! 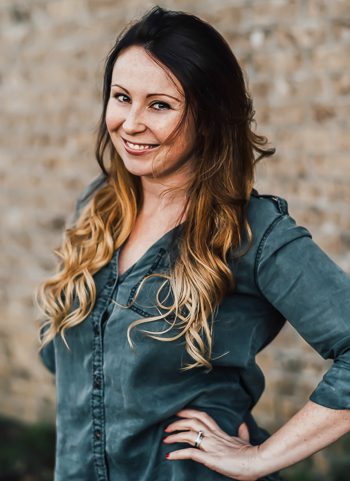 New Reader here! This looks so good! What can I substitute the beans for? Also, I’m low carbing so can I substitute air for the taco shell? And lettuce is expensive right now too. So are avocados. Also, cheese has too many calories. Bahaha Arman you crack me up! Yum tacos! I haven’t made them in forever. I need to change that soon. YUM! I love new ideas for veggie tacos! This sounds really good! yum! I’ve been eating bean tacos since I was a kid. Thanks Rachel! The flavor was insane; even the t-rex hubs was all over them! 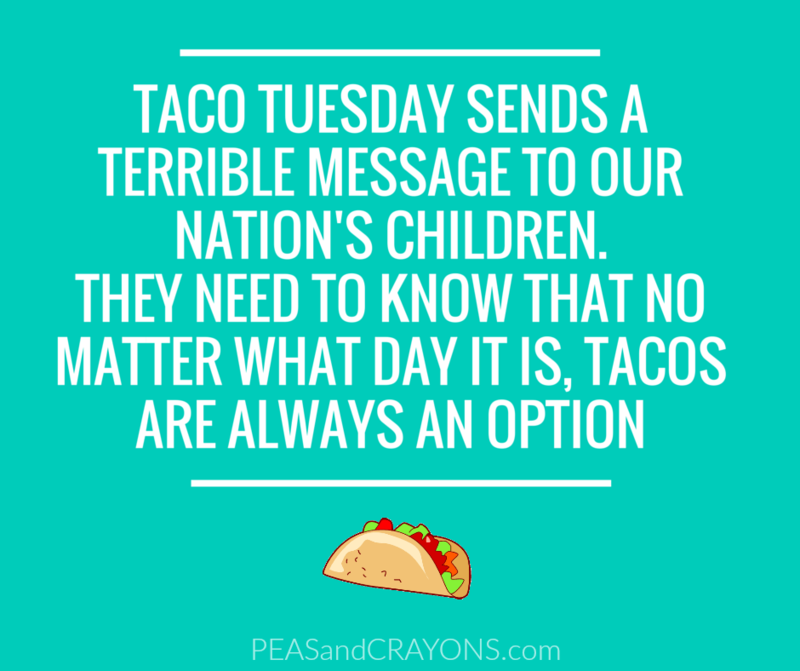 I love Taco Tuesday, and this over the top bean version is right up my alley. Also, taco holders equals genius. They’re food accessories… how could we not adore them!? Those sound delicious! I love veggie tacos, obviously, and the more awesome filling the better! tacos sound perfect right now girl! !